Poland is a country I've always wanted to visit, but never really knew what to expect. 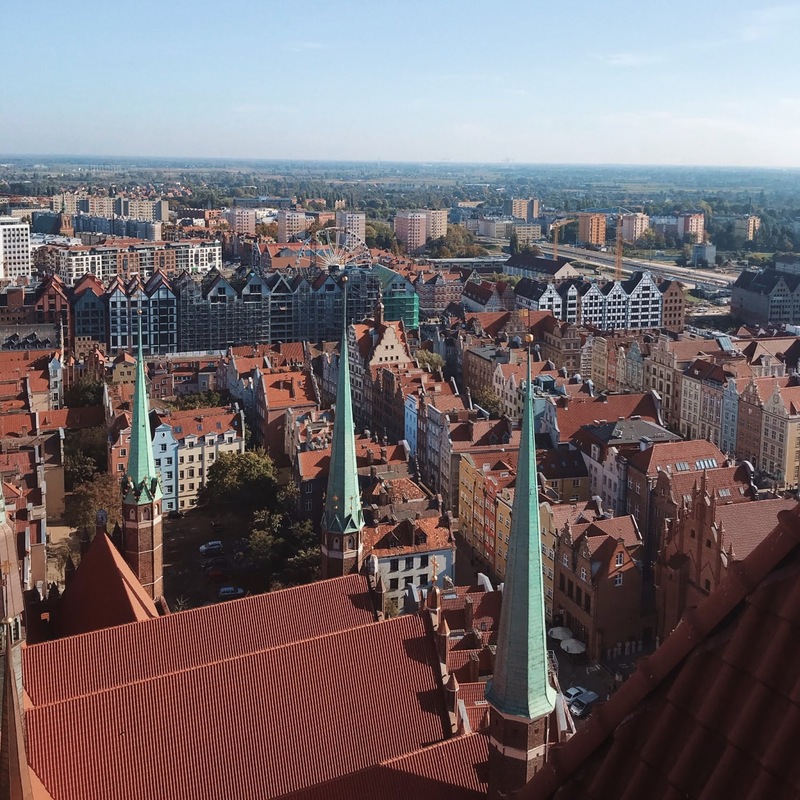 Last week, myself and Dara visited Gdańsk for the first time and let me tell you, when I say it was nothing like I had imagined, I mean that in the best way possible. There are so many reasons as to why I loved Gdańsk, from how cheap the food was, to how gorgeous the city is and how friendly the people were. We loved it so much that we're now dying to visit lots of the other Polish cities with Kraków being top of the list. If you've ever thought of visiting Gdańsk and want to know more, or if you already have a trip to this gorgeous city planned and want some inspo, then in today's post I'm going to share where we ate and what we did, so I hope you enjoy! First of all I'm going to share the link to the gorgeous Airbnb that we stayed in because it was such a bargain (only €53 a night including the service fee) and so many of you wanted to know the details. You can find the apartment here and if you're looking to book a trip to Gdańsk I couldn't recommend it enough. 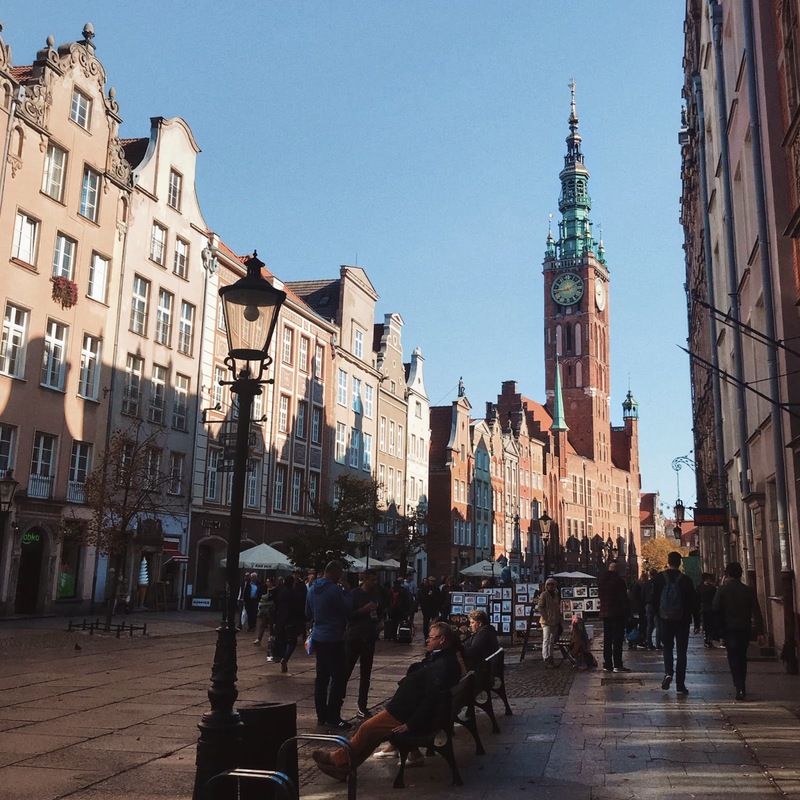 We were just a few minutes walk to the centre of the Old Town, an even shorter walk to the World War II museum and about a 10 minute walk from Gdańsk's train station. You can also sign up to Airbnb through this link to get €30 off your first trip which is always handy! If you've been following me for a while, or have read any of my other travel blog posts then you'll know that I love to experience different countries and cultures by eating ALL of the food (any excuse, right?). Much to my delight, food in Gdańsk was seriously cheap. We're talking less than €20 for a meal for myself and Dara, including alcoholc drinks. Most of the time in Ireland it'd be €20 for just one person so we were delighted! Not only was it cheap, the food in Gdańsk was delicious too. The first restaurant I found whilst researching places to eat for our trip was Original Burger. If you look a good burger, and even better fries, then I'd definitely check this place out. It was only €6.50 for a burger with two sides and it was absolutely delicious. The desserts looked incredible too but sadly I was way too full after my main course which is a very rare occurrence! It was so good that we almost went back on our last day in the city but we knew we needed to try some of the pierogi (Polish dumplings) so had to give it a miss. Like I mentioned above, we really wanted to try pierogi, which are basically dumplings stuffed with all kinds of things. I didn't know if I'd like them or not, but now as I write this post, the cravings I have for them is unreal! Pierogina Mandu has a huge menu, with both sweet and savory pierogi to choose from. I also ordered their baked pierogi too as our waitress said this particular one tasted like a hamburger and I kid you not, it tasted exactly like a Big Mac and I was fascinated. In hindsight we should have just ordered 2 plates to share as the traditional pierogi come with 10 dumplings and the baked ones came with 8. We were so full after our main course that again, we couldn't possibly fit in any of the sweet pierogi but I guess I'll just have to go back to Poland to try them! This restaurant is a little bit outside of the city but right near a train station so we went there for lunch on our way out to Sopot. Before I get into what we thought of the food, I will mention that we waited a long, long time for our food to arrive, which wasn't ideal as we were starving and wanted to get out to the beach. It was super busy and when we were leaving there was a queue for about 10 people waiting to be seated, so do keep that in mind if you want to try it out. With that being said, the food was incredible. Manekin is basically a pancake restaurant, they have every single type of pancake imaginable, with savoury options as well as sweet. I ordered the lasange pancake and it was delicious and then for dessert I had the apple fudge pancakes which very nearly put me into a food coma. Again it was very cheap, only €18 for the both of us and we both had a main and dessert as well as a couple of drinks! For some reason, every time Dara and I travel somewhere new, we always find a tall tower of some sort to climb to the top of. After climbing to the top of the St. Mary's Church tower, I have now decided that I am not doing this anymore as I am way to afraid of heights. The view was absolutely stunning, and if you're not afraid of heights by all means go for it. If you are a bit nervous, I actually wouldn't recommend this one as the last section of the stairs to the top just felt so dodgy and I ended up having a mild panic attack which wasn't ideal. It is a killer leg workout though, but yeah, my tower climbing days are over. Lots of people recommended that we check out Gdańsk's version of the London Eye and I'm glad we did because the view was amazing, especially as we went just as the sun was setting. It was only €12.99 for the two of us and it lasted for about 15 minutes. Obviously with me being a total scaredy cat, I was a little nervous especially when it stopped to let someone on and we were at the top, but I mean it was a brilliant way to see the city so it was worth it. It's just across the river from the Old Town and right next to the PURO hotel which has an amazing roof top bar so it's the perfect excuse to go for a nice, relaxing glass of wine afterwards! Visiting this museum was one of the things Dara really wanted to do whilst in Gdańsk and while it was of course very sad, and hard to read and see lots of the terrible events that occurred during World War II, it was a fantastic museum and very interesting to walk around. There was some kind of offer on so that it was half price admission which was 20 złoty (about €4.60) for the both of us. I must admit that it was upsetting at points to learn about the awful details of the suffering imposed by Hitler on the Polish people but the museum presented all of the information so well, and in lots of different formats such as videos, photos, displays of artefacts and even mock streets of what Poland would have looked like in the 1930s, that I would really recommend checking it out. Since Sopot, a cute town on shores of the Baltic sea, is only a 20 minute train journey from Gdańsk, we thought it'd be rude not to check it out. The beach was gorgeous and there's a huge pier that you can walk down and what looked like some sort of pirate ship at the end of it that I think you can go out on. If you're visiting Gdańsk for a couple of days and want a break from the city, then a day trip out to Sopot is a brilliant idea and the best part is you can stop off and get pancakes in Manekin! So there we have it, that's what we got up to and where we ate on our trip to Gdańsk. If you have anymore questions about this wonderful city then just pop me a message either on Facebook or Instagram and hopefully I can answer them. Thanks so much for reading!